World CryptoMap: USA — regulatory disparity or independence? For any crypto-related project, getting into the U.S. market — one of the largest and most profitable markets in the world — is both a dream and a nightmare. On the one hand, John McAfee is planning to run for President in 2020 and promote blockchain technologies; on the other, regulators are baffled by what to make of cryptocurrencies. In today’s World CryptoMap instalment, we are taking a closer look at cryptocurrencies in the USA. Let’s go! In the United States, crypto-related operations are subject both to federal laws and state regulations. On the federal level, all crypto-related activity except for taxation is controlled by the Financial Crimes Enforcement Network(FinCEN). Such activity should also be licensed as long as state regulations call for that. While most states (such as New York and Washington) tend to heavily regulate Bitcoin and other digital currencies, some others are way friendlier towards them. For instance, blockchain transactions are not taxed in Nevada. June 2018: The SEC declares that BTC and ETH should be classified as commodities. Still, there is no consensus on cryptocurrency classification, either within the U.S. or worldwide. Given this legal disparity, many U.S. crypto-based projects are starting to align themselves with regulatory bodies. Two of the largest crypto businesses in the US — Coinbase and Circle — have recently announced plans to launch licensed cryptocurrency securities trading. The Goldman Sachs-backed Circle announced plans to obtain a federal banking license in order to increase the range of services it provides. 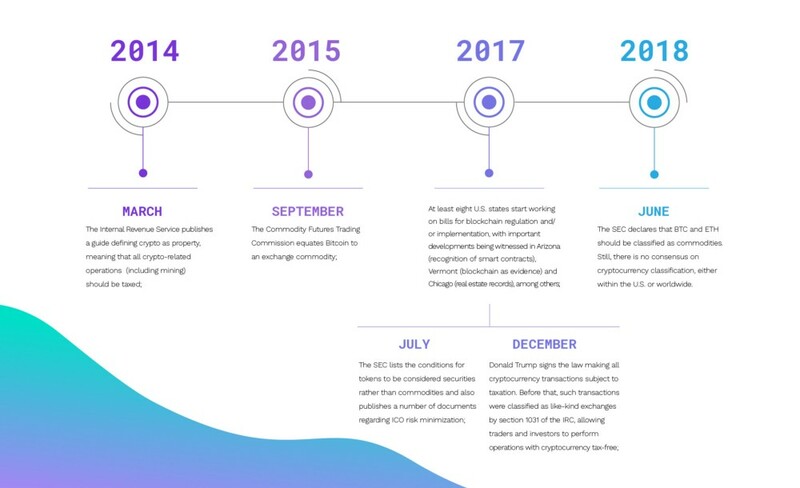 Circle also intends to be registered with the SEC as a brokerage and trading venue. Coinbase has acquired three companies (Keystone Capital Corp., Venovate Marketplace Inc., and Digital Wealth LLC.) in order to launch a new and improved Coinbase Pro crypto exchange that will allow margin trading, crypto securities trading, OTC trading and other services. Obviously, this initiative will first have to be approved by the SEC. John McAfee has expressed his intent to run for President for the second time in 2020. In his announcement on Twitter, McAfee makes it clear that blockchain technologies will be a major focus of his campaign. Elizabeth White, who made a business out of helping cryptocurrency holders to swap their digital assets for luxury cars, yachts and designer fashion items, is now launching her own cryptocurrency. The USA obviously has an incredible potential for cryptocurrency development. With that said, it is also the land of disparity for crypto holders: just like different states have different laws, U.S. businesses and traders are still unable to find common ground when it comes to blockchain technologies. The U.S. market is full of innovators, opinion leaders and influencers; yet it seems that the general population is only starting to gain a more or less substantial interest in cryptocurrencies. Do you live in the USA? We would be glad to hear your side of the story. How do you see crypto in your country’s future? Let us now in our Telegram channel!